Create your new favorite shawl using this stylish crocheted clamshell pattern! In fact, you can use this beautiful crocheted pattern to make anything; use it on rugs, pillows, or even dresses! 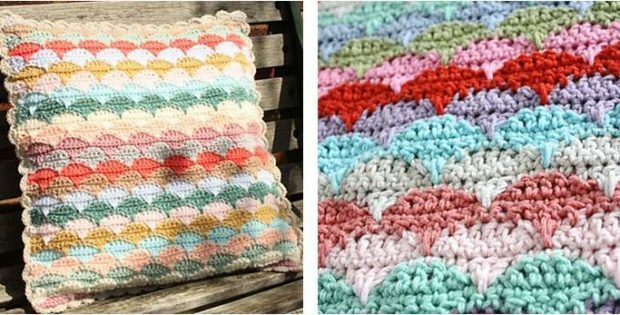 This elegant crocheted pattern is a great project for intermediate crocheters looking to master their skills. The designer behind this fashionable crocheted clamshell pattern is Sandra Paul over at Cherry Heart. In fact, you can access the FREE pattern for this beautiful and stylish crocheted clamshell pattern on her website. Additionally, Sandra included a very detailed photo tutorial on how to make this stylish and elegant clamshell pattern. It takes you through the process of making this lovely crocheted clamshell pattern, step by step. To access the FREE pattern for this lovely crocheted piece, please click on this link: Clamshell Pattern. Featured image: Sandra Paul (Cherry Heart) – thank you!